The fall of man resulted from one selfish act. Genesis 3:4-6 And the serpent said unto the woman, Ye shall not surely die: For God doth know that in the day ye eat thereof, then your eyes shall be opened, and ye shall be as gods, knowing good and evil. And when the woman saw that the tree was good for food, and that it was pleasant to the eyes, and a tree to be desired to make one wise, she took of the fruit thereof, and did eat, and gave also unto her husband with her; and he did eat. But selfishness is the opposite of God's will. Matthew 22: 37-40 Jesus said unto him, Thou shalt love the Lord thy God with all thy heart, and with all thy soul, and with all thy mind. This is the first and great commandment. And the second is like unto it, Thou shalt love thy neighbour as thyself. On these two commandments hang all the law and the prophets. Every sin emanates from selfishness. The first sins were committed by satan who wanted to elevate himself above God. Here are the Five 'I Wills' of satan in Isaiah 14:12-14 It is frightening to hear similar language coming from some Christians! "I will ascend into Heaven." This is the third Heaven, the Throne Room. I'll take God's place. "I will exalt my throne above the stars of God." "I will rule angels." Job 38:7, Jude 13,Rev. 12:3, 4. "I will sit also upon the mount of the congregation in the sides of the north." This is Earth as a place. Psalm 48:2 "I will rule mankind." "I will ascend above the heights of the clouds." "I'll be supreme." He wills to displace God as the Sovereign of the universe. "I will be like the Most High." I'll be like God. This is power lust. Every commandment is summed up in just two commandments because every sin is summed up in one simple concept. Every sin is committed because of selfishness. Here are just a few Biblical examples. All of these acts are rooted in selfishness. There are many, many more. We see it all around us. Why do people lie, cheat, or steal? They are selfish. We are all selfish. We need a savior to deliver us from the power of sin and death. Satan tempted Eve by by appealing to selfishness: 'and ye shall be as gods'. Nothing has changed. Satan still does his work by appealing to our selfishness. When is satan powerless? When we are selfless and operate as a living sacrifice for Jesus Christ. If you want victory in your life, if you want to see the power of God moving in your family, community and world, give your life fully to Jesus. Philippians 1: 20-21 According to my earnest expectation and my hope, that in nothing I shall be ashamed, but that with all boldness, as always, so now also Christ shall be magnified in my body, whether it be by life, or by death. For me to live is Christ, and to die is gain. Jesus had to abandon his divine power and die to give you eternal life. If Jesus had yielded to satan's temptations and had used His divine power to feed Himself, comfort Himself or save His life at Calvary, we would not have redemption for our sins. We would be eternally damned. Jesus paid it all. 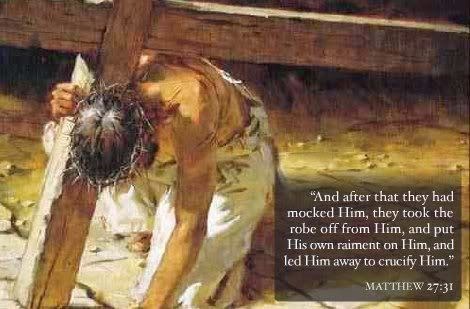 We owe it ALL to Him.